Can Dogs Eat Bananas? Are Bananas Good For Dogs? Can Dogs Have Bananas? As a pet owner, you might have wondered which fruits or vegetables are okay for your dog to consume. If you’ve ever asked, “Can dogs eat bananas?” the answer is yes. Bananas are high in potassium, vitamin B6, and vitamin C. In fact, sometimes veterinarians recommend this fruit as a healthy alternative to fatty, salty treats. The fruit is also high in fiber, which can help if your dog is having gastrointestinal problems, and magnesium, which promotes bone growth and helps the body produce protein and absorb vitamins. However, like with any food item, you should only feed your dog bananas in moderation, especially since they contain a lot of sugar. Be wary of peels. While the peels are not toxic to dogs, they are hard to digest and may cause a blockage. Even without the peel, feeding your pup too many bananas can cause stomach upset. If you have any questions or concerns about how much to give your dog, consult your veterinarian. Mash it up with his food. Mix it into a little peanut butter. Stuff it into a Kong and freeze it. Freeze the whole banana, peel it, and slice it. 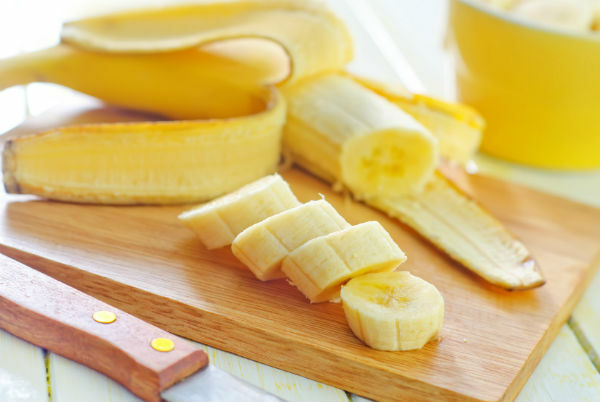 Many dogs will enjoy the sweet, starchy flavor of a plain banana, but if you’re feeling ambitious, you can make this tasty treat — no baking required! Combine the banana, peanut butter, and cheese in the blender, until it reaches a smooth consistency. Smear it over the toy and freeze.